Lately, as the equity markets reflect both the anecdotal and quantitative signatures of some risky business, we find ourselves qualifying the nature of the US economic recovery against the backdrop of the previous cycles - and asking ourselves the question, "When will it matter to the market?" It - being inflation, or lack there of. As we are all familiar with, the equity markets have a foils mentality of - ignorance until proven guilty; whereas, bliss quickly becomes panic. While it does not surprise us that the most recent economic data continues to reflect improvements in the domestic recovery, our work in the precious metals complex and the comparative blueprints of the US dollar - impressions us to believe that the greater of two evils for the Chairman, that being deflation not inflation - is persistently knocking at his door. The chart below is of the XAU Gold and Silver Index, contrasted with the year-over-year percentage change in the monthly headline PCE deflator. For perspective, the series were fitted to the previous lows in the 1990's and the trough lows from the Nasdaq bust in 2001/2002. Not surprisingly, they have correlated quite closely - with typically the XAU leading the respective turns both higher and lower. Considering the most recent PCE data was through the end of January - and the XAU subsequently slumped another 11% in February, it would not surprise us if the next headline PCE report remains under considerable disinflationary pressures. 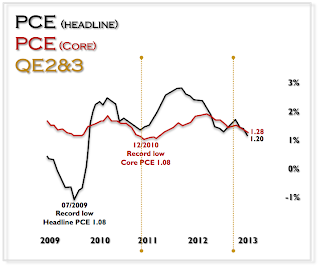 What perhaps may finally catch the markets attention and elicit a phase transition; one from a goldilocks inflation environment to a dangerous inflation environment - is that the core PCE rate for February may come close or outright break the all-time low that was recorded in December of 2010. You will notice that back then, the XAU was still reflexively bouncing out of the springboard low in late 2008 and on its way to a long-term high in December 2010. It subsequently started to rollover in early 2011 - with a double top for the index recorded in April. 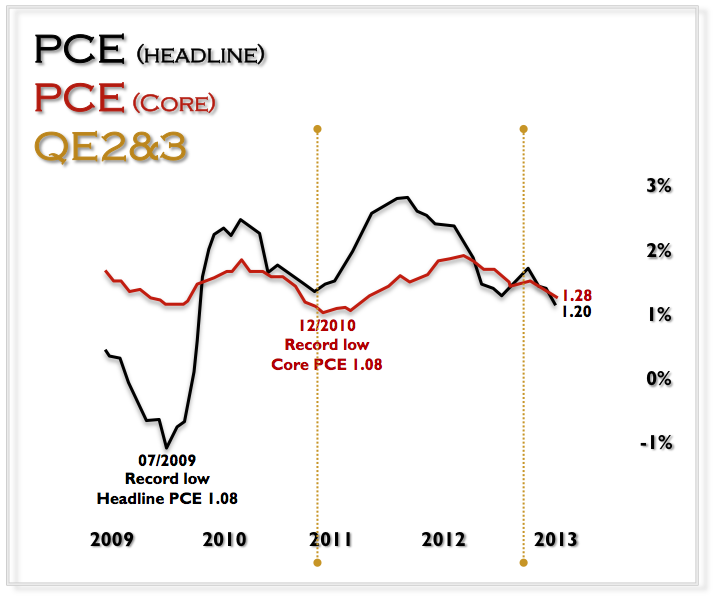 By September of that year, headline PCE inflation had begun to rollover as well. 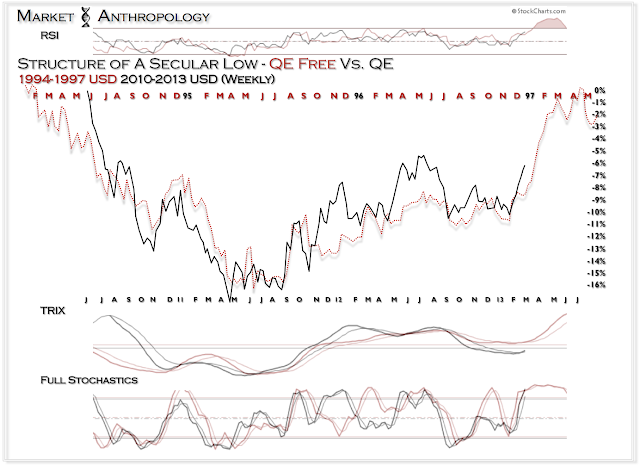 We continue to feel that until proven otherwise - the specter of deflation remains a considerable long-term risk. 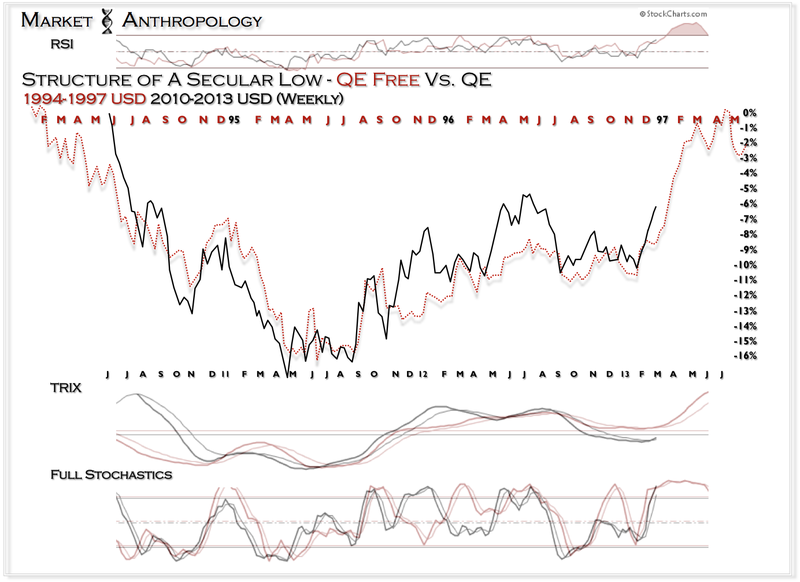 While the structure and momentum profile of the previous secular low in the dollar has been a prescient roadmap to date for trading the currency and hard commodity markets, the impetus for its turn and the monetary and psychological backdrops are worlds apart. Our concern (as the first chart is constructed to display), is the manufactured bounce in inflation expectations that began in 1998 by "The Committee To Save The World" - is rolling over as the Fed's monetary and psychological toolbox is depleted. 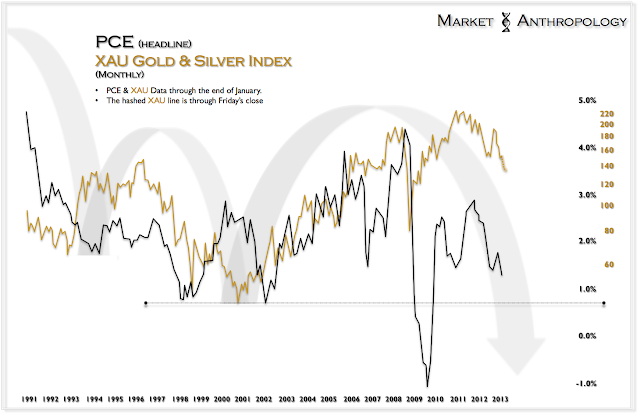 And although stocks have run exuberantly through a goldilocks inflation environment over the past year - what happens when the economic data starts reflecting what both the XAU index or the silver:gold ratio has been flashing for quite some time? It appears to be man versus nature once again, and in my experience - nature typically finds a way.